For many years Catholic residents of the Spring Hill area attended Mass at St. Joseph Chapel on the campus of Spring Hill College. The Jesuit priests ministered to the their spiritual needs. In 1937, Father Andrew Fox, S.J., was assigned full time to the quasi parish. 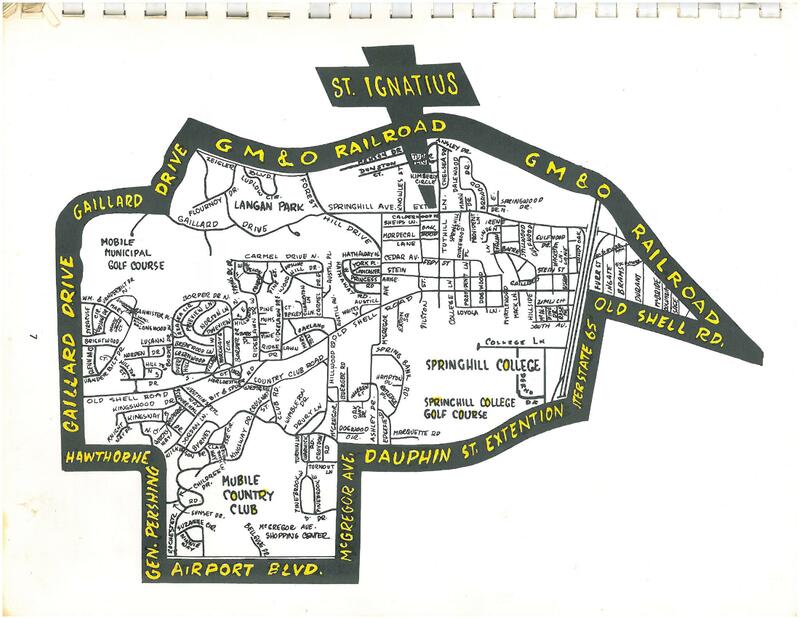 A parish under the patronage of St. Ignatius of Loyola was established in 1947. In 1952, the parish purchased the McConnell property, at the corner of Spring Hill Avenue and Tuthill Lane. Three classrooms were housed on the first floor. The second floor was converted into a convent for the Sisters of Mercy. Sister Mary Marcella, R.S.M., was named the first principal. A year later, the first unit of classrooms was constructed. The all-purpose building, which was used as the parish church, was enlarged in 1957 to provide seating capacity of 250. The following year, a rectory was built and later expanded to serve as a convent for the Sisters of Mercy. In 1977, Father Harry Crane, S.J., parish pastor, oversaw the construction of a new church building. It was dedicated in 1978, by Bishop John May. In July 1981, the Jesuits turned over the administration of the parish to the Archdiocese of Mobile and Monsignor Michael McGuiness was the first archdiocesan pastor. On May 21, 2011, Father W. Bry Shields became pastor, succeeding Father Stephen Martin.